Giroud has been considered a second-choice striker to on-loan forward from Juventus, Gonzalo Higuain who only arrived at Stamford Bridge in January. Giroud's only regular meaningful minutes have come in the Europa League and he scored a hat-trick last time out as Chelsea dumped Dynamo Kiev out at the last 16 stage. "Of course it's frustrating", Giroud told French radio station RTL, according to FourFourTwo. The World Cup victor joined Chelsea from Arsenal 18 months ago in search of more consistent first-team football but has been starved of starts under Sarri this season despite appearing to boast a good connection with talisman Eden Hazard. "Today, I have the impression there is clearly no competition (for places in attack) since January". Olivier Giroud's contract at Chelsea runs out at the end of the season, and the World Cup victor has dropped a hint as to where he could play next season. "It could be I end my career in France". 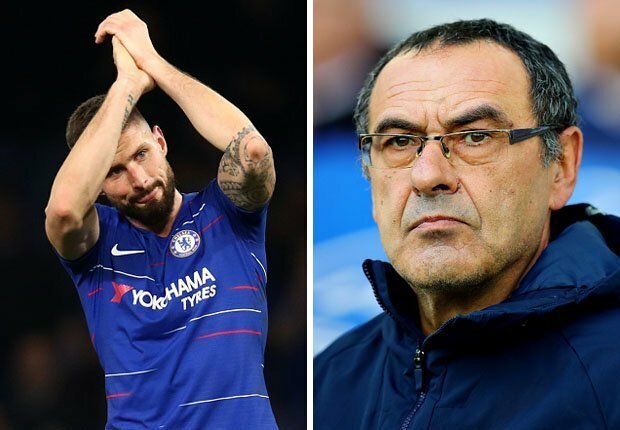 Off contract in June, Giroud hints he's being frozen out due to Higuain's relationship with manager Maurizio Sarri.